The stepson of the former gangster Dave Courtney has been shot dead in south London. Genson Courtney, 23, was shot in the head and shoulder as he sat in a hired black VW Golf in Greenwich on Sunday night. He was taken to hospital with gunshot wounds and died on Monday morning at the Queen Elizabeth hospital in Woolwich. Scotland Yard said officers were called to Banning Street in Greenwich at 10.50pm on Sunday after receiving reports of gunshots. Sources said the victim had been in a hire car and appeared to have been shot by a gunman who approached the car on foot. Detectives appealed for witnesses to contact them. Scotland Yard's Trident unit, which specialises in gun crime, has launched a murder inquiry and officers are investigating the victim's background and recent associations. A spokeswoman said they were keeping an open mind about motive. Detective Chief Inspector Mark Gower, who is leading the investigation, said: "At this early stage it is believed a male suspect may have ran from the scene in the direction of Christchurch Way shortly after the shooting. "I would like to reassure anyone concerned about contacting the police that Trident has great expertise in protecting witnesses and there are a huge variety of measures that can be put in place to protect you." Genson Courtney's stepfather claims to have been involved in debt-collecting, minding clubs, assault, contraband and murder. He has more recently become an actor and has had small roles in a number of gangster movies. 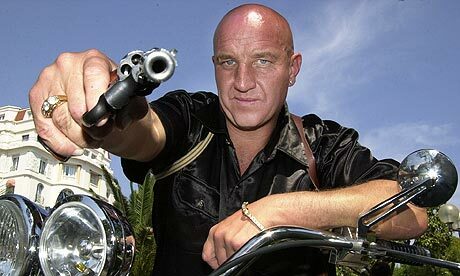 He claims to have been the model for Vinnie Jones's character Big Chris in the film Lock, Stock and Two Smoking Barrels. He has had published six books, including an autobiography. A profile on his website reads: "In his time, Dave has been shot, stabbed, had his nose bitten off (they sewed it back on) and has had to kill to stay alive himself. Tags:	"dave courtney's stepson shot dead"